As I opined many times in the past, there was no new Quantitative Easing program announced by the Fed on Wednesday. In fact, the Fed announced only one new program yesterday, titled "Operation: Huh?" Under the terms set forth in "Operation: Huh?" the Fed has finally agreed to start openly admitting that it's basically clueless about everything. I, for one, think this is a huge step forward, and possibly the most helpful program to come out of a Fed meeting in at least fifteen years. The charts suggested ahead of time that there would be no fireworks on Wednesday, and both the S&P 500 (SPX) and Nasdaq 100 (NDX) wandered their way up into the target ranges I had posted in Tuesday's update. The NDX barely squeaked in, tagging my suggested target range by only one point. Yesterday's targets were, relatively, easy; now things get a little more complicated. After spending a lot of time last night and this morning on cross-market studies of other indices, currencies, and a few commodities, I have switched yesterday's alternate count into the preferred role. My preferred view is that this is wave (ii) up, instead of wave 4. The wave 4 count has now flipped into the alternate position, and is shown on the chart by the black "Alt" labels. If this is the fourth wave, a marginal new low should follow this rally. If that's the case, the market is less likely to stage a deep retracement of the prior decline; in fact, any trade above 1264 would knock this count out. If the indices are forming a fourth wave, there is no telling what they'll do. To give you an idea of why I say this: the trading range from August until the October low was a fourth wave (of much larger degree, obviously). If you look at a six month chart, you can see that the only thing that was clearly defined about that move, in retrospect, was the trading range. Other than that, the indices meandered about for months, almost in a seemingly random fashion. Due to their somewhat unpredictable nature, fourth waves can be difficult trading environments. 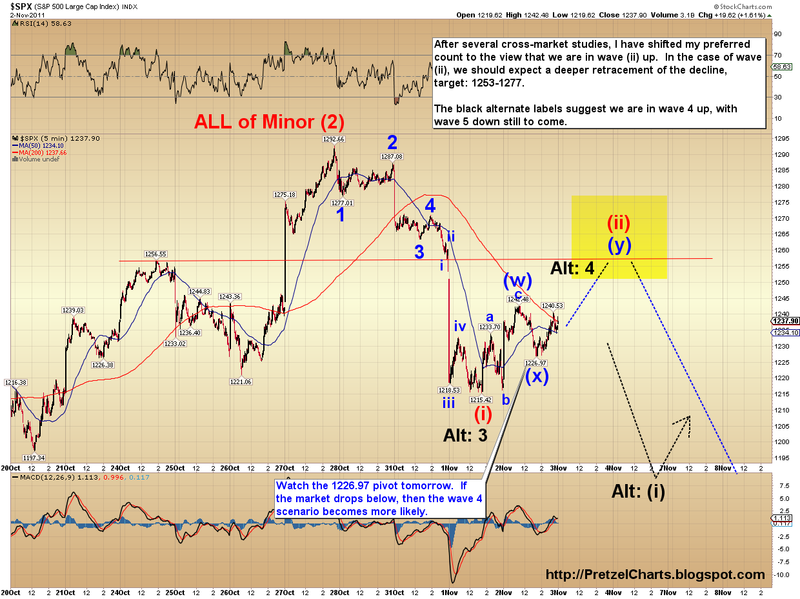 The two targets I like for the preferred wave ii count are 1256 and (if 1256 is violated convincingly) 1267. I've also drawn up a simple support/resistance chart showing some areas that may create battlegrounds in the future. This chart also highlights why I like 1267 as a possible target. I am forced to forego the NDX chart in this update, because I simply ran out of time -- however the NDX should trade roughly in concert with the SPX. The last chart I'll present is my more bullish alternate count, which is still hanging in there, and has actually moved up a notch to 30% odds. Unfortunately, the market never reached the level required to knock this count out, so it continues to remain viable. This count suggests there's one last rally to new highs unfolding now. In all of the above cases, the expected resolution after the rally ends is a deep decline to new lows. Once the top is in, I can start calculating targets for the each of the coming legs down. Trade safe! Man, I am really disappointed at how badly I have executed this week despite the fact that my cycle roadmap was spot on AND I even had the right preferred count yesterday (extended 5th had completed) and then I let The Beard's intransigence get me all beared up :(... This is one helluva tough market! Thanks, CTP. Man, I am beat. Been working on charts and this article for about 8 hours straight... on four hours of sleep to begin with. Plus I still have to get it sent to Minyanville, in their brand-new, vastly-less-friendly requested format. I gotta eat something first, though. SOO glad I moved my stops on the ES shorts down to the h/s neckline. Took a decent profit on the trade, instead of an ugly loss. wow, i woke up this morning to unload my shorts for a huge gain and now they're only up a little. As of right now it doesn't seem like the market has conviction to break through that 1256 so seems like a more likely target. I imagine there's a selloff into the weekend so today's probably the high unless there's some good news out of Europe over the weekend. What do you think CTPtrader and Pretzel? Well, I still think 1256 is good resistance, but if it doesn't hold, then 1267. Open's not looking too promising for bully right now... might have been a gift to bears right there. Uh oh, trouble in bullyville... 1240.53 didn't hold. If understand PL correctly, w(ii) leads to a more bearishly imminent count, as large w(iii) is just around the corner, possibly matching up with CTP'S nov. 4(-1/+1) major cycle turnaround. Would that be a correct interpretation of what both of you are saying? (with a acceptable range of 1253-1277, preferred target of 1268, and as long as 1277 is not violated). What's happening the reversal on the indexes Pretzel? 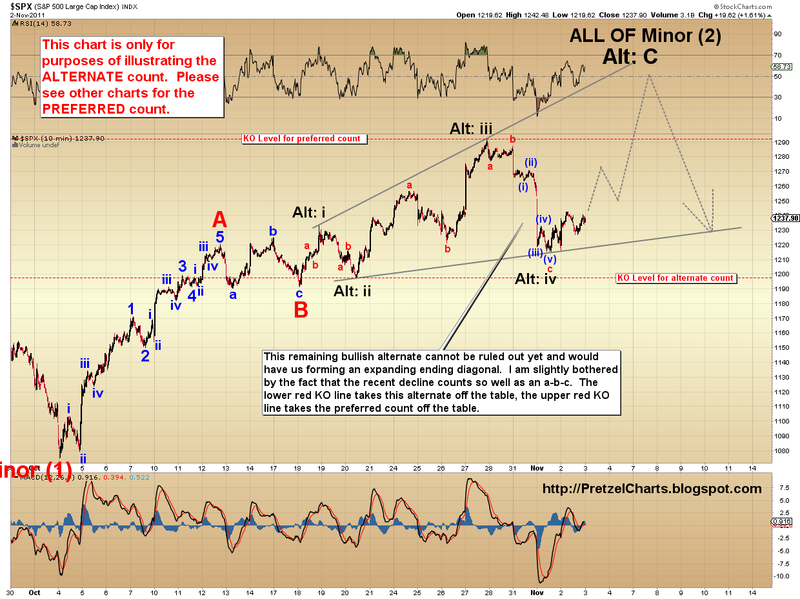 Yes, more immediately bearish if wave (ii). 1277 can be violated. Wave 2 can retrace the whole leg down if it wants, as long as it doesn't violate last Thursday's high. Big move up or down? Frank, looks pretty bearish right now. Yesterday and today's open now look like another a-b-c to form (y)... and the move down looks impulsive... to me, anyway. Show of hands... who besides me shorted the open (small postion, anyway)? I took this downswing as an opportunity to close out my positions in VXX. I didn't want to be on the wrong side of your ST projection. Really wild swings. this AM move feels too extreme...rollover that quickly? get the feeling we'll have one more melt higher today before we put in the top...that's a total hunch though. lol, think that one would pass their censors? BTW, PL, have you ever superimposed the charts of the DJI 2007/early 2008, with the current DJI 2011 chart? I looked at them a few weeks ago, and the similarity is striking, only difference is that they are one season apart, and roughly 1000 dow points apart. Even the time they take to fully evolve, are similar. The head and shoulders are very similar, the waterfall decline off the final shoulder, the high vix zigzaging up and down for 3 months, to create an accordion-looking pattern, then the strong bear-rally upward breakout, up the neckline and 200day m.a., and then---2008. Main difference that I see (in this last phase before the crash), is that everything appears to occur much faster now, than in early2008. 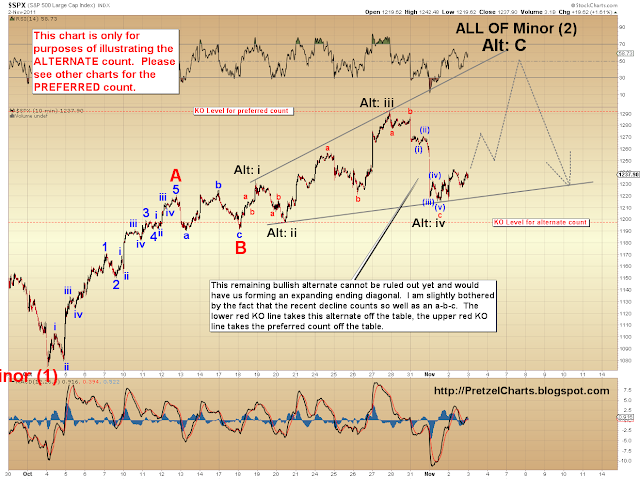 Pretzel - for the title I would mention the change in preferred count but also say big picture still bearish. One techical analyst Katie Stockton on CNBC pointed out the same point you mentioned. Good observation - A H&S rolling top followed by an initial sharp decline and then retest of 200 day moving averages. Anon, yes, but not in a month or so. Need to run another one..
spiker, I dumped my vxx as well. I just get the feeling the market won't sell off until after the jobs report...and even then, with the vix this high already, bears are going to be cautious going into the weekend. I think the dump starts monday, possibly sunday night in europe. Pretz -- just trying to stay out of the fog .. simply speaking -- from here 1241 on spx -- maybe there is 26pts of upside before we go for at least 100 points downside ride .. correct? IF so - who cares about the squiggles .. isn't time to load up and wait? POTUS, barring the ST bullish alternate count, that's pretty much my view. Today's action looks very bearish to me so far. Those "give the finger" reversals (look at SPX on a one-minute chart) are usually not a good sign. Wow, how things shift. And once again, I feel indebted to your analysis and insight. So If I'm understanding correctly, we are in either wave ii up (now the preferred count). There still remains the possibility that we are in the meandering throes of and extended four. And there still remains the outside possibility remains that the more bullish expanding ending diagonal scenario is what plays out. Not trying to restate the obvious in your article here, just thinking and wondering aloud. Since I am still very much trying to follow the E-wave structure. With the S&P currently in sharp decline off the open and looking to back test 1,240 and yesterday's close, does that change things much in terms of the preferred count? In the space of less than twenty minutes into writing this, it looks like we are back at yesterday's no-mans land only an hour into the open again. And still dropping like a stone. Already at 1,235. Nothing like at 145 point freefall to start your morning. Now back up to back test 1,240 again. Wow! I'm still of the Machiavellian / sinister persuasion that the market is looking to inflict the the max level of money extraction from the masses as possible. And in order to do that, it has to lull everyone into a false sense of hope, optimism and security. Meaning the belief must become generally accepted and widespread that bulls and longs can overcome or engineer the following: the Greece/Euro mess; the efforts of bears to take everything back down below 1,200 can be thwarted; the market can enjoy a feel-good and expected holiday / retail / tech season run up into the end of the year (and Wall Street can get their bonuses in time for X-mas). This mornings open certainly doesn't support that thesis though. Perhaps in the midst of all of this headline swoon the market is merely trying to carve out a profitable and extended trading range a la August through September where MM's could simply ride equities up and down every other week or so within defined ranges. This was immensely profitable for those who simply bought equities within a few percentage points of the post S&P downgrade lows and then set stop orders once the S&P crossed 1,200. Adn it was easy and predictable. In today's environment it seems rather difficult to imagine a sustained move above S&P 1,300. Like REALLY HARD to picture as realistic AT ALL. But getting back up there again for flirtations is not hard to imagine at all. And it's also not hard to imagine heading down below 1,200 every now and then when the headlines portend doom for Europe. And thus trading in this range through end of year while the Euro soap opera / dime store novel story unfolds. Under that scenario, would that essentially mean an extended wave 4 and a holiday season reprise of mid August through early October's range-bound trading? That scenario is a lot less dramatic and leaves everyone hanging in suspension. But it also in it's own way lulls everyone into believing that things are basically alright and incrementally higher ranges going forward are what we can all 'expect'. It would be a lulling the masses into complacency over several weeks, which could REALLY draw the general market back into long positions in a much bigger way than any other scenario. Even though the market "feels" volatile because many of us have been whipsawed as of late... I want to point out that the ATR has actually been contracting since the August low. In a way that's volatility contracting, I think that's telling us something? for me, the kicker is that we have nothing obvious now to send the market higher. If they get this drama with greece and the bailout solved, the market still won't trust it. We don't have earnings anymore to prop us up and economic data is starting to show weakness again after that false october. This market has too much uncertainty to stay up here. Even if the mega bear is premature, i think we have to test 1074. A 1040 print to complete the larger H&S pullback would induce mass panic and definitely get a capitulation move from these levels. Brian, thanks for the thoughts. The thing I keep coming back to is the fact that this decline caught virtually EVERYONE off guard. We had a mega-rally, and I promise most bears closed their shorts SOMEwhere in there. The rally breaks the head and shoulders and (to most) was giving every sign of more new highs to come. There were no RSI divergences, etc. etc. Honestly, besides me and CTP, I don't know of anyone really who was looking for a big reversal off Thursday's high. So I think the bears got shaken out already, and the bulls likewise already had their false moment in the sun. As I was saying last night, a third wave needs increasing momentum, and increasing momentum only happens when more and more people jump on the move as it unfolds... which only happens when everyone was caught off guard to begin with. Oh and I agree: 'Operation, Huh?' is right. And I also rather agree that this is quite possibly the most positive monetary policy development one could imagine and in quite some time, since it introduces the actual REALITY of the Fed's options into consideration. Very funny, btw. That made me chuckle aloud. Back at 1,240 range no-mans land again. A market with undisclosed intentions or direction, it seems. My suspicion though is that we head back up toward today's open, so that the market can provide reassurance that while things are uncertain, everything is still basically on track and okay. btw...I'm a penn state grad student, I had lunch with some of exxon's purchasing managers (they're corporate sponsors of the university). I asked them about the debt crises effects on their business. They said late summer saw a pickup in ordering but over the past month and change, they've had big red lights flashing and they've started scaling back buying programs. When the 2nd largest company by marketcap in the world starts slowing down purchasing, you need to take notice. Rocky, nice. I love "reports from the frontline" type stuff. Your caught off guard and everyone piling on the move late in the game makes total sense. Which yes, would provide all of the sentiment and psychological momentum to propel a third wave down with true force. And yes, the bulls did get a fleeing and brief moment in the sun on Thursday, though I thought it was a rather uncertain sense of hope with a lot of the market wondering if the correction was coming soon. I am thinking that the market will work to help bulls recapture that feeling before the bears can really take it to them on another move below 1,100. I think you are right that all shorts bailed during the October run up, with many bears waiting for their moment to pile back in. And I don't think that many have other than for ST trades and tentatively. I haven't yet gone short since the October 4th lows and am biding my time. I did get out last Wednesday, when I thought sentiment was peaking and also thought we'd start to see a move down after the S&P tagged it's 200 dma. What are seeing both today and with yesterday's trading though is that attempts to drive the market lower are being followed by minor bull 'recoveries' or at least holding off any major push downward (at least so far). These bull recovery waves from apparent bear pushbacks would be important to convincing the general market that we are basically okay and will weather the Euro mess just fine. And that we'll have our feel good holiday season run into the end of the year. Brian, right. The big boys probably want a little more of a chance to distribute at these levels before it slides further... I just wonder how many real buyers are left to distibute to. Greek referendum has been taken off the table by the Greek PM. I have to admit I have been having a VERY difficult time discerning the very short-term e-wave count this week. Really a confusing clusterf$%#k of a chart for SPX and especially NDX. But I think I just found a nice e-wave "tell" in the chart for RLX (retail index). The hourly chart shows a clear triangle pattern since Monday of last week. So, either this is a 4th wave triangle for RLX and 5th wave thrust up would correspond to Pretzels expanded ED for SPX (ie. new highs) OR the RLX is tracing out a series of nested 1's and 2's and is going to breakout of the "triangle" pattern to the downside in a 3 of 3 of 3 down which would correspond to Pretzel's bearish top count (in wave 2 now). Either way we should be on the cusp of a BIG move. I'll be watching RLX for clues. The Big problem in Greekville is they want the money, but they don't want the austerity strings attached - just give us the money and leave us alone - that isn't going to cut. I don't think the rest of the EU wants to support a welfare state. The party likely to take over has voted no to all the bailouts . Honestly, the best thing for EVERYONE would for the EU to help them with an orderly default, form a democracy and privatize the govt run businesses and get on their feet. The same will happen with the rest of the Socialist states. Spreading Democracy !!! That's what America does. Maybe a little of that and some changes here and we can all get out of this mess and get back to work - and gasp, maybe a bull market !!!!!!!!!!!!!!!!! Tomorrow's jobs jamboree should be the catalyst for the break one way of the other. In the bear case today's high would be the 11/4 +/- 1 cycle top, in the bull case the cycle top would arrive Friday or Monday. "The real wage withholding data, which I track in the weekly Professional Edition Treasury Report, and of which I will post an update later today,suggests that as of mid month when the BLS conducted its survey, there was a bump in real wage withholding to a gain of about 1% versus last year and last month. That's pretty typical for October, so after the gummit gets done with its seasonal hocus pocus, the reported fictitious jobs number could be somewhere near flat. Depending on whose survey you look at, the consensus calls for an increase in payrolls of 90-95,000. Given the real wage withholding data, I suspect that the seasonally adjusted number might come in light of that. The actual number should show a gain of 100-150,000." CTP, I'm leaning towards Pretz's distribution at these levels theory and setting up where to start the next leg down. If we are going to carve out a multi-week trading range for the holidays and to ride us through the Greek / Eurozone headline saga that reprises mid August through early October, then the lower end of that range still needs to be created, which hasn't happened yet. I have no idea how that scenario would play out in E-wave theory, but my understanding is that this would mean an extended (and possibly infuriating) wave 4. Wow, the blaaawg had 500 people online just before the open... that's a new record. Well, the bulls broke "the finger" from this morning, so that pattern's meaningless now. CTP, I agree regarding the charts right now. I looked at so many different averages last night/today... just a mess. Congratulations on your strong following. Well deserved. Kinda cool to be in on the early stages of the blog bubble. Bubble, did I say that? Just kidding. Be interesting to see if the bulls can turn this rising wedge into something productive. looks like it wants to test 1256 today...can't imagine it breaks on the first try, may put some small shorts back on when we hit it...but then again, maybe that level is toooo obvious? hmm, market psychology is tons of fun! btw, 1253 fills the gap, so that magnet pulling us higher will soon be gone. Yeah, I was thinking that as I nevertheless flopped my preferred and alternate counts. It feels more like a 4 than a 2. I think the dollar chart finally talked me into it (along with the fact that I'm always the lone nut calling things wave 4's when everyone else on the planet clearly thinks they're wave 2 -- or calling tops when everyone else says, "no! wave 5 coming!" -- or calling for ending diagonals up when everyone else is looking for B-down... lol). But now the dollar looks like a 4... at least, at the moment... go figure. Luckily, if it's 4 and 5, we should be able to figure that out as 5 nears completion. Pretz - I got short premkt in the R2K level near 743 -- i like your preferred count - the bullish ED is a risk but the upside move to me is muted compared to the the downside waterfall. Morning spike high was obviously shorted like crazy... how much conviction do the bears have here, is the question. How many weak shorts with stops above 1256? If 1256 gets taken out, there could be some fuel up there for another push higher. POTUS, yeah, the alternate bullish count bugs me, because of the fact that the first move down can count sooooo well as an a-b-c. I'd really like to see 1197 knocked out. But even with that... I still don't consider the alt. bullish count likely. And I still believe the market will bail out any short-and-holds from these leveals. Ugh, I hate that I can't edit typos on Blaaawger. "Leveals" sounds like a fancy hors d'oeuvre. "Perhaps, sir, you would care for some lobster leveals with your wine?" Alright, all... I've gotta get some measure of sleep tonight (today), otherwise all the charts I post tomorrow (later today) will be illegible due to drool stains. CTP, make sure Frank doesn't hurt himself on something, the blog can't afford a "slip and fall" lawsuit right now. I am back in cash... no progress on the short side. Back away and regroup. My thoughts are similar: shorted back to just shy of 1,230. And then total let up to allow run back up to the open. That's not bear conviction in my way of thinking. It's more likely bulls allowing bears to have an hour in the sun and to create a early morning opening buy in for the day. Bulls stepped back in with authority once that opening was created. Around 1,230 matches Tuesday's high, btw. And yesterday's trading low. What that means, I'm not sure. Maybe you technicians can tell me. I think bears won't step back in with authority until a move above 1,255, which is the level that I think most are waiting for to go in with amy conviction. I know I am waiting for at least 1,255 myself. I now know from the trading this week that we can get to at least 1,232 EASILY and on ANY bad headline. That's an easy 25 points of downside possibility that would happen with almost no effort other than someone minister in Europe sighing the wrong way. From 1,255 there's the giant ten point gap to the upside from Monday's trading range. That's the level of fading but still hopeful optimism from last Thursday's isand top high. And so I think it will ALSO be the level of rising but uncertain optimism for bulls expecting a possible push back up to cross the 200 dma again. I think it'll take an awful lot of good news and good headlines to get back up there. Sooo . . . if I go short somewhere between 1,255 and 1,259 (a strong possibilty), my stop it set at 1,259. If we then get past 1,261. Because that means are trending back up to hopeful optimism levels. I may try again at 1,263 with a stop at 1,265. And if that fails, then I am waiting for 1,270+ and super optimism and hopefulness to get tested again. None of this is scientific or technical. Just my read of the lay of the land. "Sooo . . . if I go short somewhere between 1,255 and 1,259 (a strong possibilty), my stop it set at 1,259. If we then get past 1,261. Because that means are trending back up to hopeful optimism levels." I would consider shorting somewhere between 1,255 and 1,259, assuming no obvious upward momentum carrying us past 1,260. I think bears step in decisively to defend here. And I'd set my stop somewhere between 1,259 and 1,261 under such a scenario. If that fails and we break 1,261, then I am assumign that rising sentiment will match last's Monday's trading levels of fading hope and optimism after the previous week's highs. Meaning waiting to see if we decisively move up to 1,265. I'd probably then go short again around there for sure. And if THAT fails, then I am looking for super optimism and sentiment levels to return and on up to 1,270+ That seems EXTREMELY UNLIKELY to me though. I think the market is looking for place to start from (meaning somewhere north of 1,255) to then take the indexes back down to mark a new near-term trading range low. And that trading range low has not yet been found. And in the meantime we need at least one more trading day at 1,240 plus to have enough time for distribution before the market movers can take things down to find our next trading range low. Just thinkiing out loud. And trying to reason out what would be the big money's max money making / taking potential. To me that's still a minor move up . . . and then a much bigger move down. I just covered my longs...basically flat other than a CRM short. Not sure If I'll be daring enough to go short before the close today, but I'll definitely be looking at it by tomorrow. What surprise upside pop could possibly come out now? the bailout is back on right? What is left other than potentially bad news? I think next week is going to be ugly. I'm with you rockytop. I'm looking for a good entry point to add to my FAZ position. I've always felt uncomfortable with the idea of averaging my average price upwards though. Well I'm glad my evolving / working theory is in line with their prodigious analytical tools. As you can see, I rely HEAVILY on weighing my assessment of general market sentiment, which is then coupled with my speculation along the lines of: If I were a market mover and I could extract as much as possible, what move would I make. It's remarkably 'unscientific' and non-technical. Monday = holding onto optimism but fading hopes. 1,260 - 1,270. I think it will ALSO mean steadily rising hopes and good news. Tuesday through Wednesday = Another round of less than positive headlines out of Europse, but the Fed just told ust that the world is not unraveling currently. 1,220 to 1,240. With 1,232 being a level you can FOR SURE get to on any bad run of headline news. Thursday (today) = Slight rise in optimism and let's hope we can get things back on track to the upside. AND insitutions want distribution here. They may just be buying time here. 1,235 to 1,259. So I don't think we cross 1,259 today, unless there is a very sharp move in the last hour, which is so commonplace these days. If there is a very sharp and strong upward move at the close today (which seems likely), my inclination would be to look hard at going short tomorrow after the first half an hour of trading. I'd still want to see what happens then and what the futures market does overnight tonight. "The two targets I like for the preferred wave ii count are 1256 and (if 1256 is violated convincingly) 1267." i was considering putting on some TZA but the RUT has a gap above between 755-760 and this market has been doing a very good job of closing gaps recently. I went for it, a small position in TZA...enough for me not to regret this level, but small enough that I have plenty of ammo left for later. Wow, way to go (AGAIN), Pretz. He's uncanny. We just had a retrace to 1,254. There will be a second (and third if necessary) attempt at 1,260 for sure before the end of the day. The big open question for me (a this point) is do we find ourselves back at the start of the week's trading range tomorrow? That was the market sentiment point of holding onto hopes but faltering optimism for longs. If we get back there, I think it's the point of delusionally rising hopes and optimism. Bulls get to recapture a senes of that Thursday feeling. 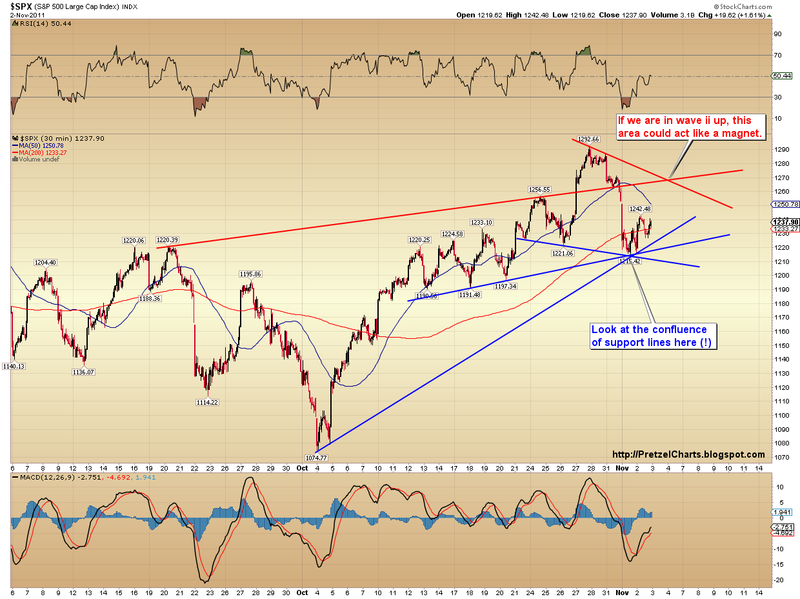 Meaning the market is creating an optimal take out point for bears to start a TRUE march down commencing next week. So by the close tomorrow do we have a week in the books where we actually close higher than where the week started? That would be kinda funny. Since this was NOT a good week. But it would make longs and bulls believe that they can weather and withstand the slings and arrows of Europe and the bears. Which would be truly delusional, since AT NO POINT this week did we actually see any kind of meaningful or sustain bear attack. That is still very much lying in wait. Ending the week on an up note though would certainly provide the false hopes and optimism to the bulls that I have been thinking may unfold. And a market with nowhere left to go but down. Rocky, I STRONTLY suggest geting out of that TZA position. The market just took a rest. But it's looking very DETERMINED to end the day on an up note. Thus driving market sentiment higher. 1,256 just fell as I was writing this sentence. Market seems to be picking it up right now. Rocky to clarify, the S&P has not violated the upward channel and trajectory it's been on since midday yesterday. The bears let up and bulls stepepd in precisely at that point that we'd violate that channel this morning. Until that channel is pierced and then back tested, I would hold off on a short position. Especially TZA which can kill you in this fast moving environment. Just my two cents. yeah, looks like a bad entry, it was a small position in TZA, nothing I'm sweating right now. SPX showing some weakening of the rally for the day. I wonder if it can challenge and break 1260 before pulling back to end the day. An impressive late surge, I didn't think anyone would push it higher this late in the day. so we're still waiting for the 1267 level which wasn't broken. Also waiting for CTPtraders 11/4 +/-1 day for the ST high. I think we might go up a little with the end of the G20 tomorrow and we'll hit the high around then? I added a tiny bit to my shorts at the close. I've definitely got some ammo left for tomorrow though. Sheesh... SPX came within 19 CENTS of knocking out the wave 4 count... but didn't. Have to check Dow, NDX, etc. Okay, Dow knocked it out. With SPX, close enough for government work; I think we can eliminate the Wave 4 scenario. This is either wave (ii) or the bullish alt. count. I continue to be immensely impressed. I'm quite aware of just how busy you are, and I don't want to overburden you with questions, so take this as more 'thinking aloud' about possibilities. I remain of the strong opinion that since August's waterful decline, the market's ENTIRE current 'objective' (if an objective can be assigned to'the market') is to lure as much money into long positions as possible . . . which will then be mowed down in another massive move downward at some not too distant future date. If that is the basic premise and investment theory, the question then falls to what series of events would need to unfold to produce the greatest level of mass participation in equities again? The period from the August meltdown to October 4th was just long enough to create enough pent up frustration and impatience for something to happen to the upside. Which then produced a run up to the S&P 200 dma. I think this would merely be the START of the lure of the masses back in. Not the final coup de grace being imminent. The run that would mollify and excite the mass investing public is now only a month in process. It's simply not enough TIME for an interest in equities to reach a crescendo and induce the average investor to think: Okay, I don't want to miss out on this, and the equity water is warm and safe to play in again. In the meantime, we have a MINOR move downward coupled with a seeming impending grand solution and bargain to stave off the Greece debt 'crisis'. And now the Eurozone banks will be 'saved' through the force of collective insanity in the form of wealth creators agreeing to incur the costs inflicted by those who don't produce a thing, by those who consume wealth and resources in enormous quantity. Yeah, that'll work. Anyway, so this creates a sense that the market has now just overcome the bear forces that would be arrayed against them. And just in time for the holiday season. What better storyline could one possibly be asked for. It even has the illusion of having achieved and overthrown an obstacle (well to this point at least). And everyone is so agreeable over there in Europe and working hard to do what's right and get along . . .
. . . so where I am going with this little missive: what if the bullish count is the 'right' one? If only because it's the hook that gets everyone in by Christmas and the New Year. And 'the market' can make a little spare change in the meantime and everyone gets to feel happy and safe for the holidays. But most importantly: By the start of next year it sets up for the MAX GAIN to the downside for those who expect to make their REAL money with simply way more defenseless bulls and their dollars to be taken out. What would a solid (but not great) feel-good November and December (with a few downs to keep the range controllable) look like? But one that has the feeling of things going higher and 2012 is looking to be just super-fabulous with happy times back on the way? We just went through a similar such sideways but with the general feeling of ever upward so slightly episode during the August through October peaks and valleys. I know the October 4th low was pretty doom and gloom for a minute or two there. But the overall FEELING of that period was generally that we had reached the lows we'd see in August and higher highs were forthcoming, if only gosh, golly, darn it those Europeans could figure their mess out. They keep wrecking the bull run we were due. And which finally DID unfold in October. What would need to happen in the meantime for the ultra-sinister and nefarious scenario of a seeming bull market run . . . that eventually lays waste to every last defenseless and out of bullets bull left standing in it? And what would the timeline be to produce exactly that sort of scenario? Right now, we sit at the end of a near-historic month. And a little three day down leg that can be shrugged off as 'healthy' and caused by headline news. But I do wonder, what would become of sentiment if the S&P crossed 1,300 again? And the Dow crossed say 12,400? And the both got there in such a way that is halting but steady enough to make everyone believe that we have earned it? And it's coupled with the widespread belief that disaster in Europe has been staved off? If I'm a sinister, dastardly conniving bear who can dictate the outcome, I don't mind that scenario one bit. Because that's the one with the MAX AMOUNT OF MONEY invested in equities. And therefore the max amount of volume selling en masse to produce the depths to which I'd want to see it all crash to. Just thinking out loud. I've been more of the persuasion that we are headed for pretty hard fall and landing SOON. But when I think about it from the perspective that the market had no problem haveing a very drawn out sideways August and September to then produce this run up. And we are just at the beginning of producing positive mass sentiment again, it seems more plausible that the major downturn that I am expecting may be a sometime in 2012 event. And in the meantime, this is all about setting the stage perfectly for it to happen. Well put Brian - it's a feeling I have as well and your verbal chart seems to play out very well with P's bull scenario. When my Broker buddy calls to jab me about having a stupid bearish outlook, that's when I will know the time is at hand to go all in. Or when the traffic on P's blog slows to a crawl, that could also be a good sign - heck, a leading indicator for that matter. Maybe P can chart the # comments / site visits to the S&P - inverse relationship!! When yo have a minute would love to know what you think of this chart. Just learning about EW myself and very confused, don't know what to think about the poster's view (it's not Daneric's chart, came from a poster). And thanks for the education! Thanks. Been spending time w/ my kids today. The book listed in my recommended reading section to the right "The Profit Magic of Stock Transaction Timing" by J.M. Hurst is generally considered as a good place to start. Also, re: the count you linked to. It's not impossible... I just think the wave he's labeled as Cycle Wave [B] counts better as a 5 than a 3. His view is actually an order of magnitude more bearish than mine... while he'd have us make a nominal new high for this move, he has that high marked as the top for Supercycle III. This is more bearish because he's saying that this decade has been part of Cycle Wave IV, as opposed to part of Supercycle Wave IV... and Supercycle IV would be worse than Cycle IV. Like I said, though, it's not impossible. Elliott Wave is as much an art as a science, which is why Elliotticians rarely agree. Also: I think the wave he's labeled as Cycle V (the current move off March '09) counts better as a corrective wave. Thanks for the insight! As I'm sure you're aware trying to sort through the various EW count interpretations out there is a bit bewildering when you're new to it. I will pick up a copy of the Hurst book to read in my "spare" time (FT job, 2 kids, house, hmmmm). While my market hours here in Tacoma are nicer than yours in Maui I need to go to bed. I look forward to your next article! I didn't know you live in Tacoma. I live in Seattle myself. And I am the proprietor of two very busy Queen Anne neighborhood restaurants. This is not a self plug / promotion. We'd be honored to have you and your wife (and children, if they happen to be along) in for dinner or brunch sometime. Well, just to add to the Washington connection... during the '08 crash, I was living in Vancouver, WA (across the river from Portland). We moved out to Maui in '09. My wife actually liked WA better (while I think WA is a beautiful state, how she could like it *better* than HI is beyond me...). SPX should be right in the reversal zone btw. Have had some time to look at charts now... futures basically flat right now, but it will be interesting to see what the morning brings. This is another (non-technical) way to see why we are due for a big correction. Pretzel, care to overlay that as well? :) Together with the macro leading indicators, your work will become priceless! TJ, seems like I would need a bigger sample than given in the article for it to have much significance, don't you think? Any idea where to get a larger data sample? I'd be willing to take a look at it. Futures still slightly negative, but I think I'm favoring a new high for wave (ii) yet... almost done w/ the charts. Maybe not. I keep going back and forth between charts trying to reconcile. Friggin' rally is a complete mess to count. Just a shot in the dark, here is my guess for today: The employment figures come in as expected, it is a Friday after a week of stressing over the Fed and Greece, and we have had a nice 2 day rally still below the recent high, so we trade in a quiet range today with a conservative close into the weekend. So employment figures were better than expected, that should support a rally to start the day. Futures spiked, now selling off hard, down 5. I really favor a new high yet still, though. I think we're in a small fourth wave -- that's my best guess anyway. Almost done w/ the article. Thanks for all the great charts and insights Pretzel! JSE a little down today, but my shorts nicely down - really had nowhere to go. If the US doesn't rally tonight it provides more proof to the notion that news is just noise what with Greek referendum now off the table. Especially if Papadreou makes his confidence vote. New update is posted, so let's continue any discussion on that thread.